Delta Stewardship Council member Gloria Gray (above left and below) listens as Friant Water Authority General Manager Ronald D. Jacobsma (right) explains Friant’s keen interest in the Delta and its issues. 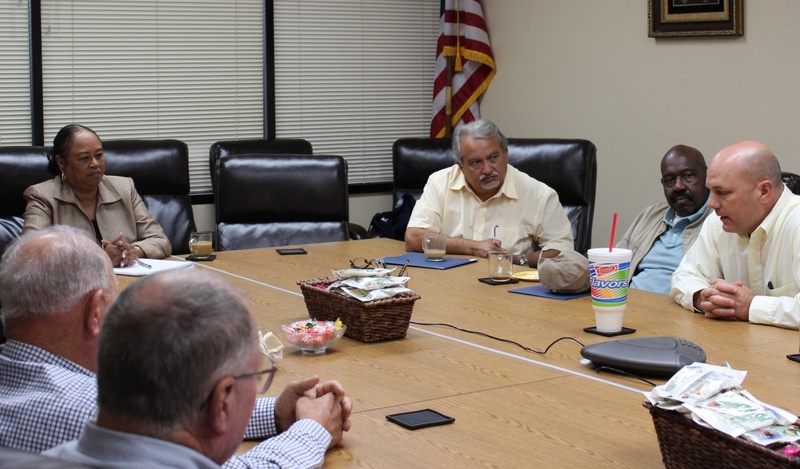 Others at the Fresno meeting table included (lower left, then clockwise) Carl Janzen, Madera Irrigation District; Harvey Bailey, Orange Cove Irrigation District and FWA Chairman; Mario Santoyo, FWA Assistant General Manager; and a friend of Gray’s, Leonard Tibbs. With so many crucial and dynamic issues continuing to unfold, Friant Water Authority officials never turn down an opportunity to meet on home turf with a state water leader. The latest such meeting occurred October 12 when the FWA joined the Nisei Farmers League and California Latino Water Coalition in meeting in Fresno with Gloria Gray. Gray since 2010 has been a member of the Delta Stewardship Council, an agency created by legislation to achieve state mandated co-equal goals – a more reliable water supply, and protecting, restoring and enhancing the Delta ecosystem. She noted that the Latino Water Coalition “was deeply involved in the Delta Stewardship Council legislation.”Since 2006, Gray has been a director of the West Basin Municipal Water District in southwestern Los Angeles County and also serves as one of West Basin’s two representatives on the Metropolitan Water District of Southern California Board of Directors, of which she is a co-chair. 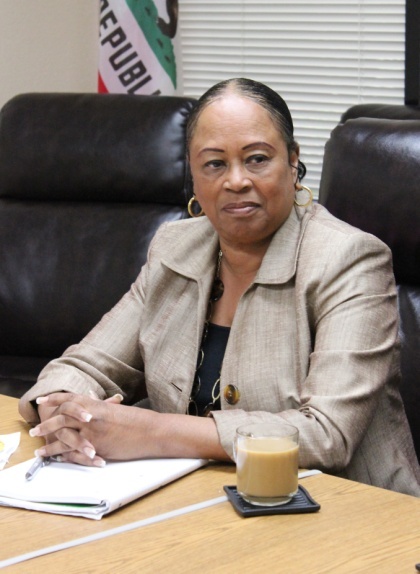 She said visiting the San Joaquin Valley was particularly crucial. “Agricultural is very important and that is what a lot of people do not think about,” Gray said. Gray believes progress is being made on finding Delta solutions and repairing infrastructure such as unstable levees. FWA General Manager Ronald D. Jacobsma summarized operations and issues of the CVP’s Friant Division, including implementation of the San Joaquin River Settlement and the Restoration Program’s Water Management Goal. Under the river litigation Settlement, the latter goal is to seek to return as much water used in Restoration as possible to Friant users. Jacobsma also explained Friant’s involvement in Delta issues, which is related to the Bureau of Reclamation’s ability to deliver a substitute supply of water exported from the Delta to the San Joaquin River Exchange Contractors. The Exchange Contractors are the San Joaquin River’s historic water rights holders. The substitute Delta water delivered at Mendota Pool enables water to be delivered at Friant Dam into the Friant-Kern and Madera canals for conveyance to water users. Another Delta connection enables deliveries through the California Aqueduct to the Cross Valley Canal and, by exchange and pump-back deliveries in the lower Friant-Kern Canal, to several districts. He noted that well over one million acres of highly productive eastern San Joaquin Valley farmland depend upon Friant and Cross Valley water, as do several cities and towns. Gray also participated in a meeting and agricultural tour in western Fresno County near Firebaugh. She had previously expressed interest to FWA Assistant General Manager Mario Santoyo, who is active in the Latino Water Coalition, in an opportunity to better understand the valley’s perspective as it relates to the Stewardship Council’s work.